Ancestry.com provides extensive background information and careful disclaimers on how to interpret their “Ethnicity Estimates” and the various “Regions” which are shown in it. In my opinion it’s a more honest approach than followed by 23andme for their Ancestry Composition. As it will decrease the chances of customers being left confused or misled by their DNA results. You will be doing yourself a great disservice if you skip the helpful information offered by Ancestry.com by not clicking on the regions shown on your DNA results page or the ? buttons. Trans Atlantic Slave Trade patterns (see this section for a full overview) as well as the history of precolonial population migrations within Africa. DON’T take the labeling of the AncestryDNA regions with country names too literally. Ancestry.com mentions themselves how their “regions” (perhaps more properly termed ancestral/genetic components) might be named after specific countries but in fact they are found in neighbouring countries as well. Plus some of the regions will have a higher “prediction accuracy” than others based on how Ancesty’s own samples (“typical native”) score when they get tested (i will post the screenshots on the bottom of this page for those who don’t have access). Therefore I don’t think we should get caught up too much in how these regions are named. It’s just proven to be very difficult to come up with 100% appropriate labels, this goes for any DNA testing company sofar btw. Genetic clusters don’t respect manmade borders drawn by colonial powers. In other words none of the AncestryDNA regions are unique or mutually exclusive, because just like anywhere else in the world African ethnicities have been intermixing for ages and show overlapping ancestral markers. There’s no such thing as a “pure” bloodline if you go back far enough in time. This might complicate a breakdown into neat categories we all would like to see, but being aware of this fact does provide more insight for your results. Personally I have a feeling genetic clusters correlate much more with the big language subgroups within the Niger/Congo language family (see the ethno-linguistic map section). But even so people speaking the same or related languages might still have divergent DNA profiles because we all have unique familytrees which transcend ethnicity if you go back in (pre)history far enough. AncestryDNA is NOT meant to be taken as the “gospel truth” nor is it meant to be a substitute for someone’s family tree. Rather it may be seen as a valuable starting point for exploring how your ancestry can be described regionally speaking. Ancestry.com explicitly mentions they are providing Ranges (which include 0% for Trace Regions) & Estimates about someone’s possible ethnicity given their (limited) dataset of reference populations. This might stand in the way of an exact matching with just one single ethnicity as many of us might wish to see. However the same problem of genetically delineating ethnicities inspite of overlap has also occurred for Europeans and it seems to be inherent to BGA ancestry testing. Ethnic intermixing and genetic similarities across borders have always existed. It is what it is. I have a feeling many people are expecting quick & straightforward results without taking into account the complexity of it all. Perhaps also given false hope by the way DNA testing is being advertised. This kind of regional resolution for Africa is very much in its infancy stage and will undoubtedly be improved in the future. Also adding new reference populations should help things. I’m still personally doubtful if any future finergrained regional/ethnic breakdown, no matter how welldesigned, can ever truly be “100% accurate” for Afro-diasporeans specifically. Afro-descendants generally having a myriad of thoroughly mixed African ethnic origins because their African origins would date back mostly from a time period (1700’s) when they might have had in between 64 up to 512 or even more African born ancestors from various areas (see this link). Also it’s often misunderstood how African ethnicities themselves have not been transfixed in time but are rather evolving continuously through migrations, interethnic mixing, language shift etc., implying that genetically it will be very difficult to assign a welldefined and unique “blue print” for any given ethnic group. These disclaimers are not meant to be disencouraging in any way but rather to put things in perspective. I do believe strongly you can obtain some very valuable ancestral information by way of DNA testing. But you’ll have to invest some time and research to make more sense out of it all and not take everything at face value or be quick to dismiss results when they do not conform with your preconceived notions. It’s been my experience that if you keep all of this in mind and lower your expectations you can get more out of your personal results. The “Ethnicity Estimate White Paper” is provided by Ancestry.com to explain their methodology. It’s a fairly technical account but can be useful for anyone looking for more details behind their Ethnicity Estimates. Below overview shows the number of samples being used for each African Region. This sample is comprised of Biaka, living in the village of Bagandu, in the southwest corner of the Central African Republic (3.42N; 18E altitude approximately 500m). This group is probably an admixture of 3/4 “non-pygmy” African ancestry and 1/4 Mbuti ancestry. The transformed cell lines were established by Judith R. Kidd. The sources of this sample are L. Cavalli-Sforza (Stanford University) and K.K. Kidd, J.R. Kidd (Yale University). The sample is composed of Nilosaharan and Niger Kordofanian speaking Mbuti pygmies from the northeastern part of the Ituri Forest (northeastern Democratic Republic of the Congo). It was collected by L.L. Cavalli-Sforza in 1986. This sample from [Senegal] is part of the Human Genome Diversity Cell Line Panel collected by the Human Genome Diversity Project (HGDP) and the Foundation Jean Dausset (CEPH). This sample consists of unrelated individuals and was collected with proper informed consent. Most of the Yoruba individuals in this sample are urban health care workers from Benin City, Nigeria, collected by Prof. Friday E. Okonofua and collaborators; cell lines established by Dr. J.R. Kidd. This sample from Namibia is part of the Human Genome Diversity Cell Line Panel collected by the Human Genome Diversity Project (HGDP) and the Foundation Jean Dausset (CEPH). This sample consists of unrelated individuals and was collected with proper informed consent. This sample is part of the Human Genome Diversity Cell Line Panel collected by the Human Genome Diversity Project (HGDP) and the Foundation Jean Dausset (CEPH). This sample consists of unrelated individuals and was collected with proper informed consent. – S. Africa – Bantu SW Ovambo. the “Africa Southcentral Hunter Gatherers” Region is based on Biaka, Mbuti and San samples. The Bamoun (from Cameroon) as well Brong (from (Ghana) and Yoruba and Igbo (from Nigeria) are being shown in this pre-release version of AncestryDNA. I have the least certainty about the ethnic samples being used to define the “Mali”, “Ivory Coast & Ghana” and “Benin/Togo” regions. But i suspect for Mali it would be either Dogon or Bambara samples (as they are also being used by Ged-Match calculators), for Ivory Coast/Ghana it might be the Brong from Ghana (an Akan subgroup) as shown in screenshot above plus in addition some unspecified Ivorians, while for Benin/Togo i’m guessing they will be mostly Gbe speaking ethnicities. Taken from a Ancestry.com press release, this PCA (principal component analysis) plot below is VERY insightful to interpret the various AncestryDNA Regions. Too bad only that the Southeast Bantu and South-Central Hunter Gatherer Regions are missing from it. The Benin/Togo and Ghana/Ivory Coast categories seem to cluster most closely according to this plot. Cameroon-Congo is quite condensed while Mali and Senegal are scattered and Nigeria seems to have some substructure. Senegal seems to have the most genetic distance to the other clusters. When describing their 9 African AncestryDNA regions Ancestry.com mentions explicitly that because of widespread shared ancestry regionally speaking, a “typical native” from any of these regions will usually also get a breakdown into several AncestryDNA regions and not fit 100% in their national region. This below chart (taken from the Ancestry.com website) shows it clearly. 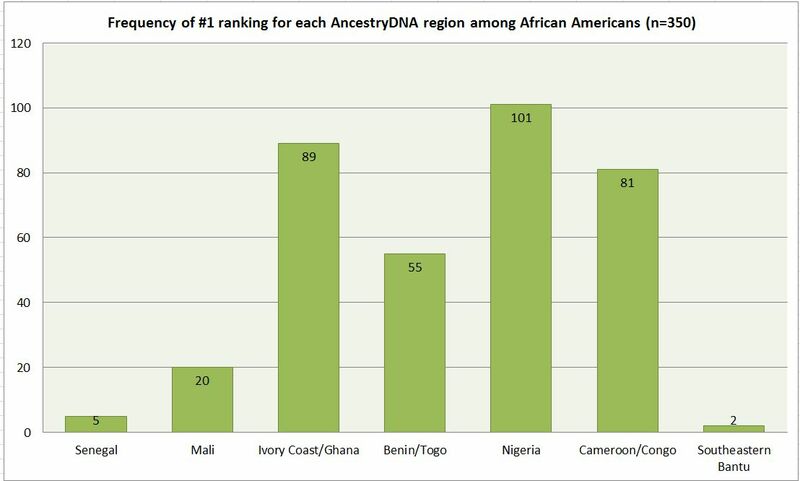 We can see for example that the 16 Malian samples used by Ancestry.com show great genetic affinity with the samples from Ghana/Ivory Coast as well as those from Senegal. Of course another randomly chosen group of Malian samples might show different patterns depending on their ethnic background. That’s why it’s always crucial to know whether the reference samples are representative in any way. The samples from Nigeria also seem to be relatively “admixed’ in that they show genetic affinity with several other neighbouring regions besides Nigeria. The exception being the samples from Senegal and North Africa who do fit in 100% in their own self termed region, however individual samples from Senegal might still show additional regions (see screenshots posted in the last section, one Senegalese sample being shown as “only” 52% Senegal). The ethnicity estimates of the “typical native” actually representing the median and not the average of the samples. Below graph (taken from the white paper) is showing the average “correctly predicted ethnicity” as a black line, while the coloured bar seems to depict the range of correct estimates for each separate region. You can see clearly that Mali has the lowest prediction accuracy (just below 0,4/40%) and Senegal has the highest one (black line is shown at 1.0/100%) while Cameroon/Congo seems to have the narrowest range of correct estimates (always above 0.8/80%). Taken as a whole the African regions seem to be reasonably robust, also when you compare them with the key European regions like “Europe West” & “Iberian Peninsula”. Taken together with the previous screenshots as well as the ones in the last section of this page (“Regional descriptions by Ancestry.com”). you can get a fairly good idea about the “predictive accuracy” of each region. It might not be perfect but that’s perhaps also not to be expected 😉 It’s certainly a major step in the right direction for describing African genetic affiliations in a regionally detailed format. Not knowing exactly which ethnic groups were used as samples for each region makes it trickier to come to any conclusion. Seemingly contradicting interpretations might still be all valid, being case dependent and also relating to the Afro-diasporic nationality of whomever is taking the AncestryDNA test. There’s also the circumstance that despite being a pioneering effort and providing much regional detail there’s a conspicuous absence of separate regions for Sierra Leone, Liberia as well as Angola in the present version of AncestryDNA. This is understandably because of a lack of adequate sampling but nevertheless it’s good to keep in mind because these countries are crucial places of origin for many Afro-diasporeans. And without any separate regions in place for these countries obviously any genetic ancestry hailing from these parts will be covered by the existing regions instead. Curiously neither Sierra Leone or Liberia seem to get mentioned anywhere in the regional descriptions offered by Ancestry.com. Angola however is mentioned as being a country where the Cameroon/Congo, Southeast Bantu and South-Central Hunter/Gatherers regions can be found. According to the information given by Ancestry.com Senegal might be one of the most reliable and distinctive regions despite the relatively small number of underlying samples (most likely Mandenka from eastern Senegal). A “typical native” impressively scoring 100% for it. However it will not strictly capture Senegambian ancestry but very likely also other ethnic origins from Guinea Bissau/Conakry and perhaps also western Mali depending on ethnic groups! The way Cape Verdean AncestryDNA results consistently show Senegal as nr. 1 main region seems to confirm it as a very stable category. So perhaps even if it’s being shown as a Trace Region there might be a great chance it could be legitimate. The frequency of Senegal scores among various Afro-descendants in the Americas (lowest among Anglo Caribbeans and highest among Hispanic Caribbeans) also seems to corroborate its predictive power as it is in line with known slave trade history. It will be interesting to see how an addition of other Senegambian samples, like the Diola or Wolof, might influence the predictive accuracy of this region. In sharp contrast with the “Senegal” region, the only 16 samples being used for the Mali region (smallest number of all) seem to have been much less homogenous. A “typical native” only scoring 39% for “Mali” and additionally also showing much “Senegal” and “Ivory Coast/Ghana”. The DNA markers associated with the Mali region might still be distinctive but are apparently not covering the full ancestry of the Malian samples available to Ancestry.com. This implies that this region is probably the most difficult one to make sense of and i suspect in many cases won’t be referring to actual Malian ancestry at all! It might signal different types of ethnic/regional origins on an individual case basis but perhaps also be correlating with the specific history of one’s Afro-diasporic background. Just based on the results i’ve seen for African Americans and Puerto Ricans i’m guessing it could be describing ancestral connections to especially Guinea Conakry and Sierra Leone in many cases, as this would be in line with their documented slave trade patterns and group averages (see future blogposts). In other cases, perhaps particularly for Anglo Caribbeans, it might signal instead ancestral connections with northern Ghana and/or Burkina Faso, especially Gur speaking groups. The only African result i’ve seen scoring substantial Mali is someone from Liberia but he “only” scored 17% for it even when being from a Mande speaking ethnicity. Many African Americans & West Indians have scored much higher for Mali. We’ll have to wait for an update of AncestryDNA to get more clarity. An increased samplesize and more representative reference populations for Senegal/Mali will hopefully lead to a more accurate detection and assignment of proper Upper Guinean markers and exclude the current “Ivory Coast/Ghana” affinity. As shown already in the screenshots above the 99 samples (second largest number) from this region seem to describe a pretty solid ancestral cluster although overlapping in part with the samples from Benin/Togo. I have no confirmation for it but it seems for the Ghanaian samples the Brong or Abron, a Akan subgroup were used (among others perhaps?). In accordance with common expectation this region could be very useful for singling out Akan ancestry, however it picks up other ancestral origins as well, especially to the west it seems, incl. origins from Liberia and quite possibly also Sierra Leone (depending on specific ethnic groups). Confusingly this is not mentioned by Ancestry.com themselves in their regional descriptions! However the results of an Ivorian (of mainly Akan background) as well as a Liberian are clear indications for this being the case (see “African Results“). Both scoring over 80% “Ivory Coast/Ghana”. Judging from the Afro-diasporean results again this region seems quite predictive and consistent. Anglo-Caribbeans scoring the highest for this region followed by African Americans while it’s much less noticeable among Hispanic & French Caribbeans, in line with known slave trade history. Hopefully on the next update AncestryDNA will create a separate region for Sierra Leone/Liberia, that way this Ivory Coast/Ghana region could more exclusively be seen as a proxy for Akan ancestry. As seen from the PCA plot there seems to be a great degree of overlap between the samples from Benin/Togo and Ivory Coast/Ghana, although the latter show more of a spread to the west. Still this region seems to describe a distinct ancestral cluster judging from the way a “typical native” scores. However it is apparently not exclusive to the presentday territory of their rather narrowly and eccentrically shaped countries (a colonial legacy). The DNA markers characteristic of the “Benin/Togo” region seem to be found in great frequency also among Nigerians to the east (both for Yoruba’s and to a lesser degree also Igbo’s) and also to the west among Ghanaians (probably especially non-Akan groups). This complicates a proper interpretation of any significant score for this region. Judging from the surprisingly elevated level of Benin/Togo scores among Anglo Caribbeans and especially African Americans it’s wise to be careful in drawing any premature conclusions when getting high scores for this socalled Benin/Togo region. It might signify different and wideranging ethnical roots depending on your own nationality. For Haitians (whose few results i’ve seen do show the highest score for this region as expected) and Brazilians this category is very likely to be derived from the Fon, Adja or Yoruba. Given their confirmed and well documented ancestral/cultural connections to Benin and Yorubaland. For African Americans and Anglo-Caribbeans it ‘s perhaps more likely indicative of Ewe or Ga ancestry from Ghana/Togo or else also generic southern Nigerian. However anything’s possible in individual cases and genuine Beninese ancestry (to a partial degree) could still be an option as well 😉 I’m assuming the 60 samples being used by Ancestry.com are currently mostly Gbe speakers. Also there’s already a sample group of Nigerian Yoruba’s and possibly one of Ghanaian Akan/Brong. To be honest i’m not sure if adding more samples will improve this region being more properly confined to Benin/Togo’s borders, as it seems to be indicative of an ancestral cluster that’s widespread across the region (Lower Guinea) and possibly correlated to crossborder migrations from many centuries ago. For more detailed discussion see also this subpage: “Benin/Togo” region. This region brings together samples from a very large area and by the manner it has been designed it’s most unfortunately capturing ancestral connections to both the Congo and the Bight of Biafra hinterland (southeast Nigeria + western Cameroon). As already mentioned two Igbo results i’ve seen scored substantial “Cameroon/Congo” %’s which implies that any Igbo or related southeastern Nigerian ancestry from the past could also have resulted in inherited DNA markers nowadays being read as “Cameroon/Congo” by AncestryDNA. At the same time it could also signal genuine Congolese ancestry. Hereby obscuring any genetic affinity for two very crucial ethnic groups contributing to the Afro-Diaspora: the Igbo and the Bakongo (see these slave registers from the Anglo-Caribbean). Genuine ancestral connections to ethnic groups from Cameroon seem least likely judging from the slave trade history, but it’s still also an option to consider. Judging from the Afro-diasporic results i’ve collected this category is still all in all reasonably predictive. It’s peaking among Haitians which makes sense as their share of Central African origins is probably among the highest outside of South America/Brazil. Otherwise it’s also showing up prominently for African Americans and Anglo Caribbeans, but right now there’s no way of telling if it’s pointing towards Congolese or rather Biafran ancestry. A splitup of this region in a future update by Ancestry.com would be highly advisable as the distinction between Bight of Biafra and the Congo is a must for a better understanding of the main regional origins of Afro-diasporeans. This is a pretty straightforward ancestral cluster based on samples from both the Khoisan and Pygmies. It’s the equivalent of the socalled “Central & Southern African” category on 23andme. Judging from the results i’ve seen of people testing with both Ancestry.com and 23andme their scores for this region/category correspond quite closely indeed. For many Afro-descendants it will most likely be capturing Pygmy affinity instead of San affinity, representing an ancient and dilluted component brought over by Central African Bantu speakers whose ancestors were already intermarrying with Pygmy groups centuries or even millennia ago. Especially the Bakongo from Congo and the Fang from Gabon are known to have high Pygmy (Biaka) admixture. It’s usually only showing up as a minor Trace Region although it’s still likely to be accurate since it’s based on very distinctive DNA markers. I’ve not really seen any positive correlation between this region and the “Cameroon/Congo” or “Southeast Bantu” ones as one might have expected, so perhaps it’s sometimes being included in those regions instead. There’s also the question whether these small %’s might in some cases be deriving from recent Pygmy ancestry. I will devote a future blogpost to this topic soon. For now i will say anything’s possible on an individual case basis, but i’ve never come across a historical reference suggesting any systematic and sustained importation (in high numbers) of Pygmy slaves into the Americas. It’s intriguing though that some of the African results i’ve seen also show this region, including an Ivorian (2%) a Nigerian (3%) and a Northeast African (3%). None of these countries known for harbouring Pygmy or Khoisan populations, at least in the presentday. So again it could be indicative of very ancient ancestral connections instead. Hypothetically this region would cover the largest territory, “anything south and east of the Congo”. Therefore potentially it might capture ancestral markers from a very wideranging area eventhough it’s based on only 18 samples. From the results i’ve seen even Northeast Africans (Somalia, Ethiopia) score this region for their “SSA” part (in the absence of a more fitting region based on Nilotic samples). However i’m guessing that for most Afro-Diasporans it will be indicative of Angolan or (interior) Congolese ancestry. Mozambican and Madagascar ancestry are also theoretical possibilities but more remotely so based on slave trade statistics. When combined with additional evidence the Madagascar options may be made more plausible though. As Angola doesn’t have its own separate region yet (despite probably being the greatest souce of African slaves to the Americas as a whole) it’s very likely that most of Angolan ancestry will be described by this category . For northern Angolans who are ethnically Bakongo it might be more so “Cameroon/Congo”, see also the detailed maps on this page. The Afro-diasporic results i’ve seen for this region are largely in agreement with known slave trade patterns. This socalled Southeast Bantu region showing up lowest (on average) among Anglo-Caribbeans. But for Latin Americans it’s among their biggest regions corresponding with their documented very significant ancestral connections with especially Angola. For American Americans the Southeast Bantu % is showing up more pronounced than for Anglo-Caribbeans on average and it’s very likely referring to more than just strictly Southeast African origins. Slave trade from these parts being estimated to be below 2% of the total, while West/Central African slave imports, incl. parts of northern Angola, would be about 25% for the USA (see this page). I have a feeling that there’s much room for improving the SE Bantu category which seems quite shakey because it’s only fueled by 18 samples from most likely Namibia, South Africa and Kenya. Strangely enough these samples are right now also partially showing affinity to the Middle East and North Africa! (see screenshots below). Obviously adding samples from Mozambique and Angola will provide a much better picture. Similarly to the Senegal region the North African samples being used by AncestryDNA also seem to define a very distinct and reliable region according to the information provided by Ancestry.com (see screenshots above). However it seems to be based on different samples than used by the North African category on 23andme, quite possibly only Mozabite Berbers from Algeria. While 23andme also includes Levantine and even Gulf Arab samples in their socalled North African category… This region seems to be negligible or non-existent for most Afro-diasporeans located in the USA or the West Indies but it’s much more noticeable for Afro-descendants from Latin America as well as for Cape Verdeans. However, Latin Americans with high North African scores will typically have only a minor part of total African ancestry and in fact their “North African” ancestry will usually be derived from other sources than via the Trans Atlantic Slave Trade. Canarian/Guanche ancestry as well as Moorish or rather “Morisco” ancestry via Iberia being most likely. A third possible explanation being that it’s signalling Sahelian (interior of West Africa) origins derived from especially the Fula people (a.k.a. Fulani/Peulh) who according to several DNA studies usually carry an ancient “North African/Berber like” ancestral component. This option is bound to be more relevant especially for the few Afro-diasporeans from the USA/West Indies who do show trace amounts of this region (within the 1%-3% range). This also goes for Cape Verdeans who in addition might also have inherited these “North African” markers directly from Mauretania/southern Morocco because of early slave raiding by the Portuguese along their coastlines (1400’s/1500’s) as well as minor Sephardic Jewish migrations from North Africa to Cape Verde in the 1800’s. It’s interesting that even for people with only minor total African ancestry their African Trace regions will usually still be shown as quite diverse. It’s however good to realize that according to Ancestry.com these Trace Regions will have a reduced confidence level and include estimates of zero %! I have a feeling that these Trace Regions are often just DNA segments that are too difficult to capture/classify by Ancestry’s analysis right now or representing “generic” African ancestry. For most people their unexpected or “exotic” scores usually show up as only small %’s and Ancestry usually labels them as “Trace Regions” meaning that they are least likely to be accurate. Not saying that it’s just “noise” per definition but there’s a higher chance of it being misidentified. Exceptions possibly being the more distinctive/outlying regions like North African, Senegal, South-Central Hunter/Gatherers and Southeast Bantu which may be easier to identify even as Trace Region. Hi, if a person scored majority Nigerian, would it be more Igbo or Yoruba? This article said the Ancestry DNA results were based partly on Yoruba samples. But on a lot of websites, it says way more Igbo were imported to the Americas during the slave trade. Yoruba weren’t imported until the end of the slave trade. Is that true? Thanks. Another way to answer your question is to have a systematic look at the DNA matches reported for either Igbo’s or Yoruba’s tested on AncestryDNA. I am actually intending to do exactly that in an upcoming blog post! I can already tell that judging from the few profiles i have reviewed the number of DNA matches for Igbo’s is far greater than for Yoruba’s. With Ancestry’s customer database being composed overwhelmingly of Americans, this is especially pertinent for African Americans. I have seen the DNA matches being reported for a Ghanaian who’s also Ewe. There are probably more Jamaicans than Haitians right now in Ancestry customer database, so the odds might be a bit skewed. Still both Haitian and Jamaican matches were being reported, with litte difference in average segmentsize. I am actually preparing a blogpost dealing with the DNA matches being reported for Africans across the continent. I am also looking forward to seeing more Africans of various backgrounds doing the AncestryDNA test, it will be insightful both for themselves and for people in the Diaspora wanting to learn more.